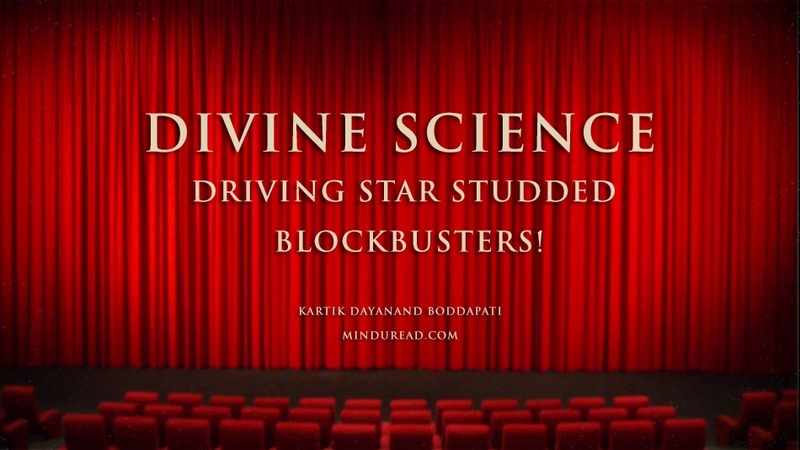 Divine Science driving star studded blockbusters! He won’t stop – that’s the literal translation of ’Aagadu’, the title of a Telugu movie that released last weekend. True to its name, the movie was unstoppable at the box office, netting close to a million dollars on the day of its release in the US. An unprecedented number for an Indian film, leave alone a Telugu film. I was constantly bombarded by Whatsapp updates from my friends in the US who flocked to the screens in droves as if their lives depended on this movie. Closer home, the story was no different - despite negative reviews from critics and 140 character experts on Twitter, the film marched on triumphantly. I watched the movie in a Delhi NCR multiplex which was packed to the brim - a rarity in this part of the country. Craze for the movie wasn’t surprising. Aagadu is after-all a big budget movie made by a popular director with a successful track record starring one of the most charismatic heroes of South India - Mahesh Babu - the central reason for the all-round mania over the film. However, while watching the film I realized something very strange. Something that changed my whole perception of going to the movies…more so…big budget movies starring the likes of a Salman Khan, SRK, Rajinikanth, Pawan Kalyan, Mahesh Babu, Vijay, Ajith, Surya, etc. Apart from their usual charisma to pull the crowds, I realized that their movies have a divine supernatural force that we are yet to fathom. On multiple occasions on my blog, I have written about the logic behind modern blockbusters. Two posts that come to my mind immediately are the ones that I wrote about Shahrukh Khan’s Chennai Express and the Telugu film Manam. In the Chennai Express post I speak about the rickshawala concept where all of us in the modern world are like the hardworking rickshawalas of the past who would go to the theaters to entertain themselves - to let go of their worries. Thanks to inflation and the steep rise in multiplex ticket prices - we have become selective in the kinds of movies we want to watch on the big screen. Add to that the availability of other means of entertainment via TV, YouTube, pirated CDs, and the problem compounds leaving us craving only for big budget films starring A list stars on the big screen doing the same things that they have been doing for ages. In the Manam blog post I expand this concept further by speaking about legacies - where we are happy to embrace star kids over newcomers because somewhere they give us a feeling of continuity, comfort and familiarity that we unknowingly crave for. Same applies to remakes and sequels of movies. The continuation of legacies is a key factor that drives our behavior and purchasing decisions. Hence the repetition of various elements by the stars from their previous movies - almost like a formula - hero introduction fight, hero intro song, item song, half a dozen fight scenes, comedy track, etc, etc, etc. All these elements, when milked to the maximum, result in the audience rewarding the movie with 100, 200 crore plus collections at the box office. The rest, the non-formula based films – they sadly wallow in oblivion. However, one has to wonder – we could still skip watching those big budget movies on the big screen and instead wait for them to appear on TV or grab a pirated copy since piracy is rampant everywhere. Why do we shell out big bucks to watch those films in the theaters? They are not even like live sports events where all the action unfolds in real time. This is recorded stuff. Something else is at play here and that is the divine force that I mentioned at the start of this post. To make sense of what I am going to say next, I need to first speak about the concept of positive and negative energy in our physical world. A person with negative thoughts, when he or she interacts with physical elements in this world - their energy is transmitted to those objects. This energy will in turn get transmitted to those who touch those objects. Same applies to positive energy. This energy even travels in the air via sound waves. Speaking of sound, I recently read about the logic behind temple bells. It seems, the moment we ring the bell, the bell produces a sharp but lasting sound in the form of an echo. This sound touches the seven healing centers or chakras in our body, also creating a unity in our left and right brain which empties our brain of all thoughts - a perfect state to enter the serene atmosphere of any temple. The chants and rituals along with the aura and ambience of the temple fill people with a collective positive energy. Out of curiosity, I Googled to check the reasons why people visit places of worship. I checked for Churches, Temples, Gurudwaras and Mosques. And to my surprise all of them have similar logic and justifications. The act of performing namaz or aarti or mass, all have a similar goal - to increase a sense of brotherhood among people. To make them feel a part of one whole. There is divinity in the collective energy that is manifested by these acts of prayer. Now let’s get back to our original topic, films. I know it is illegal to capture images inside a theater but I couldn't help doing this while watching Aagadu. I shot this 6 second Vine clip on my phone during the introduction of the hero. Don't forget to switch on the volume on the video. Though the video captures only 1/100th of the actual scene in the auditorium - one can hear the screams, whistles and claps. There is a frenzy unleashed among the audience - a frenzy that has a contagious energy to it. That is the moment when we connect not just to the film but also to everything that surrounds us - the audience and the collective energy unleashed by them. That is when the realization occurred to me. The movie going experience wasn't anything normal - it transcended into a divine state, almost like a spiritual experience. This isn't a phenomenon that is unique to Aagadu, it happens every time there is a big ticket movie release that follows the formula. Think Rajinikanth's trademark style or Salman Khan's aura or Pawan Kalyan's magnetic presence, they drive the audience into a frenzy. Content of the film is mostly immaterial as long as the formula is intact. Nothing explains the box office collections of Aagadu otherwise. For instance, I watched Salman Khan’s ‘Kick’ on a rainy day, in an empty theater in the third week of its release. The kick was totally missing - there was no audience reaction to compliment Salman Khan’s energy on screen. The missing D - divine element was totally absent. Not sure I would have felt the same way had I watched the movie on the first weekend of its release. God forbid, riding purely on star power - if the movie isn't able to recover its budget and make profits in the first week of it's release, it could be doomsday for the film. This is almost like a new dimension to watching films. While Hollywood depends on 3D to lure us to the theaters, we seem to be depending on the Divine! Truth be told, this isn't a new phenomenon. Ever since I was a kid I have been seeing this kind of hero worship and audience frenzy, especially down south. My earliest memories go back to the 80s where a Chiranjeevi movie meant total commotion both inside and outside the theaters. People used to queue up overnight for the tickets, the roads outside jammed for hours. Getting tickets to his movies on the first day was like the equivalent of getting the iPhone 6 gifted to you on launch day by none other than Tim Cook himself, it was that coveted. Another instance I vividly recall is from the late 90s when Rajinikanth’s Padayappa released. I was in my first job back then at Pentafour, in Chennai. Since we had done some VFX work for the film, through an influential contact in our organization, bulk tickets were arranged for our team members, most of whom didn't know a word of Tamil, including me. Once we were inside the auditorium, despite the language handicap, every single person from our team had the time of their lives lapping up the onscreen gimmicks of Rajinikanth and the accompanying crowd frenzy. I still can’t forget the sight of our always straight faced HR manager who was literally clapping and jumping with joy in his seat. Even after all these years, that day still makes for great conversations whenever I meet my old colleagues. The point I am trying to make here is that such movies existed in the past and they exist even today. It is just that other kinds of movies peacefully co-existed with formula films back then...not anymore. This is a fact validated already by Hollywood and Bollywood where the big formula films rake in bigger and bigger amounts, while the smaller offbeat films collect smaller and smaller amounts at the box office. Also, the window for these movies to work their magic ran into weeks in the past, now it's just the first weekend that seals their fate. The only factor that seems to be driving us to the theaters these days is this unstoppable force that we can’t seem to escape. It has nothing to do with the quality of the movies but more to do with validating our existence through the energy and collective consciousness of others around us...an experience that transcends us and the movies from the ordinary to the divine. See you at the cinemas. Apple Watch and the Evolution of the Matrix!